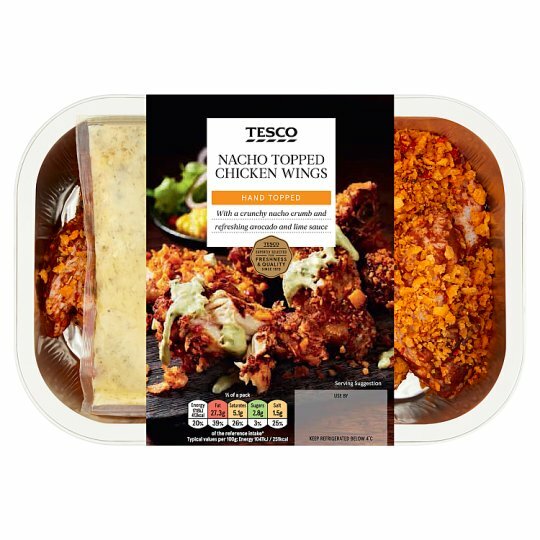 Chicken single joint wings coated in a Mexican spice rub, with an avocado and lime sauce sachet and crushed nacho topping. INGREDIENTS: Chicken Wing (81%), Avocado and Lime Sauce Sachet (9%) [Rapeseed Oil, Water, Gherkin, Avocado, Pasteurised Egg Yolk, Spirit Vinegar, Sugar, Parsley, Lemon Juice, Salt, Concentrated Lime Juice, Cornflour, Vinegar, Mustard Seed, Onion Powder, Garlic Powder, Black Pepper, Gelling Agent (Pectin)], Crushed Nacho Topping (5%) [Tortilla Chips [Maize Flour, Sunflower Oil], Red Pepper, Rapeseed Oil, Spices, Sea Salt], White Sugar, Spices, Salt, Garlic Powder, Green Pepper, Chilli Extract, Dried Onion, Parsley, Yeast Extract, Stabiliser (Xanthan Gum), Lime Oil, Paprika Extract. May contain milk.For allergens, see ingredients in bold. Keep refrigerated below 4°C., Keep refrigerated. Once opened, use immediately. Instructions: Chilled: 200°C /Fan 180°C/Gas 6 40 mins Place foil tray on a baking tray in the centre of a pre-heated oven for 40 minutes. Heat the sauce sachet in boiling water for 2-3 minutes. Serve chicken with the sauce. Remove sleeve and film lid.Remove the sauce sachet and keep to one side.After handling the sachet, wash hands thoroughly. Caution: This product will contain bones..Caution: This product contains raw meat..